A commercial fisherman, Vinh Pham of San Jose, California, was charged with illegally shooting and killing a great white shark over the summer, the California Department of Fish and Wildlife (CDFW) announced on Thursday (Jan. 24). Pham was given a $5,000 fine and placed on conditional probation for two years. Authorities also ordered that his firearm be destroyed. 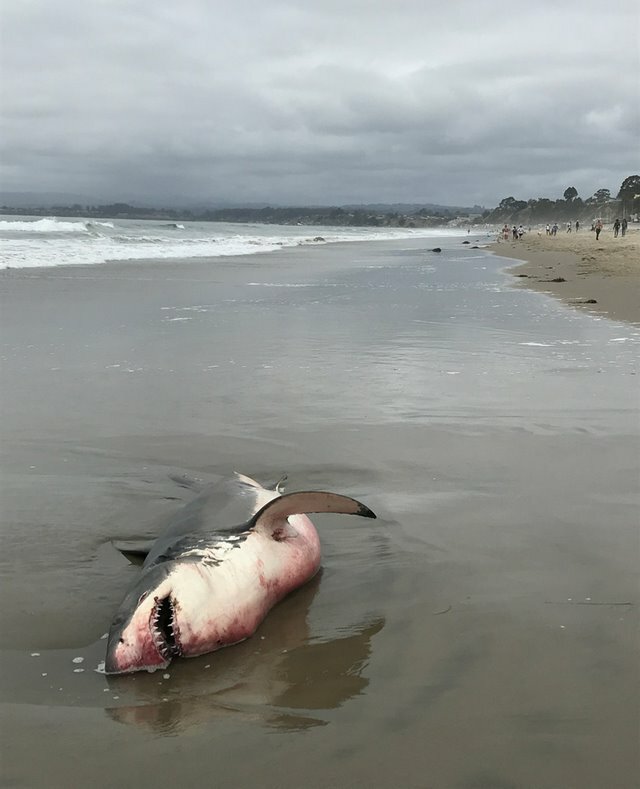 The mysterious death of the 9-foot-long (2.7 meters) great white shark made headlines last June when it washed up on Beer Can Beach in Aptos, California, and became the subject of a criminal investigation. Great white sharks (Carcharodon carcharias) are classified as vulnerable by the International Union for Conservation of Nature and are illegal to catch without a special permit. At the time, wildlife officials were tight-lipped about the case. They disclosed that the results of the shark's necropsy (an animal autopsy) led to a criminal investigation by the CDFW's Law Enforcement Division but shared no other information. Now, we've learned why. The necropsy revealed the presence of three .22-caliber bullets in the shark, said Capt. Todd Tognazzini of the CDFW Law Enforcement Division. The wounds from the bullets weren't obvious to onlookers who found the shark on the beach back in June. Local news agency KION even reported that the shark looked like it had been healthy when it died and appeared uninjured. But one of those inconspicuous gunshot wounds had hit the formidable predator in just the right spot and severed the spinal cord, killing the shark, Tognazzini told Live Science. Three days after the necropsy, CDFW received an anonymous tip that a member of a commercial fishing vessel in the area might have been responsible for the shark's death. The investigative team immediately sprung into action and set up surveillance that evening in the area where they thought the boat would be. Their informant was spot-on. "The boat set up and set its net immediately offshore from the location where the shark was, which corroborated the information from the witness," Tognazzini said. The fact that the fishing boat returned to the scene of the shark's death was no surprise to Tognazzini and his colleagues. "Most fishermen, if they're having success, that's a very common thing," he said. "People that have had success return to the areas where they've had success." Pham and his crew were using a round haul net to fish for phototropic fish, which are members of a species that are attracted to light, Tognazzini said. The main species targeted are typically bait fish, such as smelt and sardines, but a round haul net is not species-specific, so it scoops up a wide variety of species. When the boat returned to the dock the next morning, wildlife officers were there waiting to greet the crew and perform a routine inspection. The officers discovered multiple violations, including illegal, undersized halibut and the crew's failure to turn in landing receipts declaring their catch. Officers also found a loaded .22-caliber rifle behind the seat of the truck that Pham used to transport fish to the market. When investigators asked Pham about the dead great white shark, Pham claimed that he didn't shoot the shark but had directed a crewmember to do so, Tognazzini said. Officers seized the gun they found in the truck and sent it and the bullets found in the shark out for forensic analysis. In the meantime, investigators tracked down the crewmember who Pham said committed the crime. When officers questioned him, the crewmember denied that he was the one who shot the shark and said it had been Pham who pulled the trigger. The investigators also learned that the crewmember was a convicted felon and could not legally possess a firearm. When investigators returned to Pham to try to get the true story, Pham confessed. Tognazzini said that Pham told investigators that he was afraid to confess earlier, but realized the evidence was mounting against him. Pham admitted to having shot the shark when it swam close to his fishing net the night before it was found dead on the beach. "He felt it was disturbing his fishing activity," Tognazzini told The Mercury News. "He was upset with the shark and decided to shoot it." Pham won't serve jail time and didn't receive the maximum penalty for his crime. "In most wildlife cases, that is what happens," Tognazzini told Live Science. "It is unusual in wildlife cases for people to serve any jail time." Pham can continue fishing with his commercial fishing license for the time being; however, a commercial permit review could take that privilege away sometime in the future, Tognazzini said. This case highlights the importance of the wildlife crime anonymous tip line, Tognazzini said. "If it weren't for some citizen who came forward, we never may have solved this case," he said. "Their tip directly led to our successful investigation."